The man who ended the featherweight championship reign of Abe Attell, Johnny Kilbane spent much of his life in the public eye. Kilbane defended the featherweight title for eleven years and, in retirement, became a senator in the Ohio state legislature. 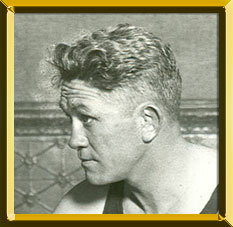 A Cleveland native, Kilbane started fighting professionally in the Ohio area in 1907 with three victories, according to the somewhat spotty records of his early career. Kilbane was a good scientific boxer who could also punch. He fought Attell three times, twice in championship bouts. In 1910, he lost a decision to Attell. Two years later, on a extremely hot night in Vernon, California, Kilbane took the crown from Attell with a twenty-round decision. Kilbane scored frequently with his left jab, while Attell resorted to heeling, butting, and elbowing. After the fight, Kilbane claimed that Attell had coated his back with chloroform in an attempt to daze his opponent. Attell said it was cooling cocoa butter and, for many years, bore ill will towards Kilbane for this charge, which Kilbane often repeated. Through five title bouts, including one in 1913, in which he fought Hall of Famer Johnny Dundee to a draw, Kilbane defended his crown until 1923. In 1917, Kilbane attempt-ed to move up in class and faced the lightweight champion Benny Leonard in a non-title fight. Kilbane could not handle the heavier Leonard and was knocked out in three rounds. World War I put Kilbane's professional boxing career on hold while he served as a boxing instructor at Camp Sherman. In 1921, Kilbane again defended his title in Cleveland with a knockout of Danny Frush. In 1923, at age 34, he returned to the ring after almost two years of inactivity to face Eugene Criqui at New York's Polo Grounds. Reportedly, Kilbane received $75,000 to come back. At the time, Criqui was the European champion. Past his prime, Kilbane could not handle the punching power of Criqui, who had the champ sagging on the ropes and knocked him out in the sixth. Never known for his knock-out power, Kilbane knew how to put forth just enough effort to win. If necessary, he could throw a mean punch, but for the most part, he was content to outbox an opponent and avoid getting hit. In retirement, Kilbane refereed and operated a gym as well as serving in the state senate. He was clerk of the Cleveland Municipal Court when he died in 1957.